A relaxing spot in your garden or a useful seat by your front door, bench cushions can be made to your dimensions. Follow these steps to ensure a proper fit for your custom cushion. Do not order new cushions based on measurements of your existing or old bench cushions. Over time, cushions can become worn and the fabric stretched. Using these measurements will result in cushions that may not fit your furniture. Instead, measure the bench on which you will use the new cushion. DO NOT measure the old cushion. 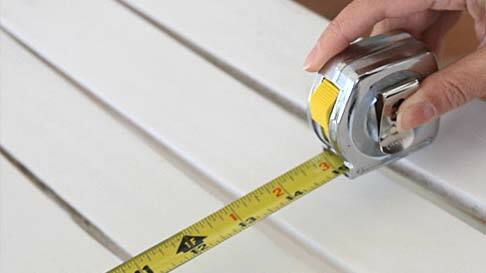 Use a firm tape measure (ie, a carpenter's), rather than a flexible measuring tape (ie, a tailor's) for the most accurate results. Keep in mind that when ordering, you will need to round up or round down to the nearest ½ inch. Measure the width of the bench's seat. Measure the depth of the bench's seat. Decide the cushion thickness you would like. Bench cushions and pads are available 2-8 inches thick (in 1-inch increments), depending on the type of cushion or pad you select. If you are also ordering a back cushion for your bench: Make sure to subtract the thickness of the bench cushion from the height of your furniture's back dimension, or the back cushion will be taller than the back support when put into position. If your bench seat is any shape other than rectangle/square, you will need to make and send a template (pattern) for your furniture. To learn how, visit How to Make a Template. If you have any questions, give us a call at 888-348-2371 or contact us. Our customer service representatives will be glad to help. This video gives step-by-step instructions on how to measure for a bench cushion. These are the measurements you'll need to place your order.